This is my final DG message. It is with pride and nostalgia that I look back on this past year of service to you as your District Governor in the first year of District 5495. When we began this journey together in July 2017, we were hopeful that our new District, merged from two cultures, would transition successfully during this first year. Many volunteers worked tirelessly to prepare our programs and services, and to them we owe a debt of gratitude. During the course of the past 11 months, dozens of you stepped up to take on new leadership roles, serve on teams and act on new ideas. We have experienced many successes this year, and our hopes have been realized. And, it’s all because of you, our members and friends! Cinco de Mayo in Nogales may never be the same! Nineteen Rotarians from Districts 5495 and 5500 joined Rotarians and other guests from Nogales to bring our celebration number to nearly 50 to kick off our Rotary micro credit program. Hosted by our micro credit administrator, FinReg’s President Juan Baca, and his Special Projects/Rotary manager Art Cordova, the event was coordinated by Global Grant Host Club Nogales Sur, and International Partner Tempe South. 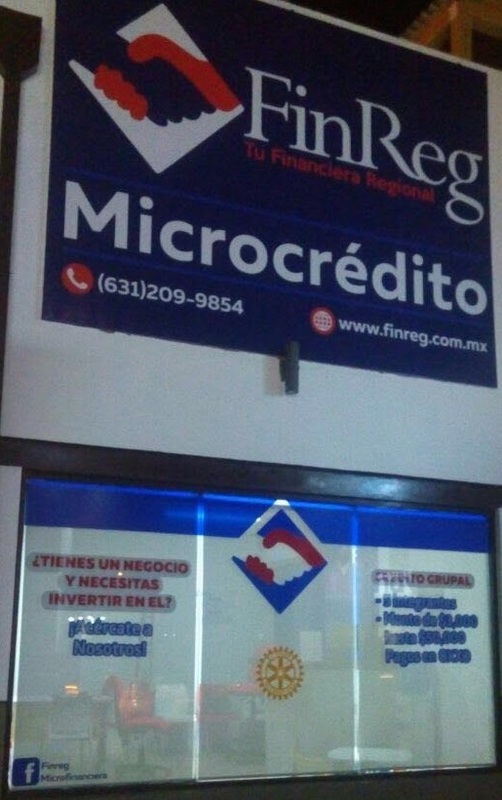 Along with a prestigious group of Rotarians and town luminaries, Nogales’s Mayor Cuahtemoc Galindo was also present for the ribbon cutting to open the Rotary/FinReg Micro Credit Office. After the office opening, the group proceeded to the host hotel and dinner along with Mexican-style entertainment. Scottsdale Sunrise Rotary has been partnering with Visa Del Camino Social Services of Scottsdale to assist with their needs to serve the community of Scottsdale. Vista Del Camino provides services with a food bank, emergency financial assistance, job preparation services, career center, back-to-school clothing program, holiday adopt-a-family and numerous others areas of need for the citizens of Scottsdale. You may think that Scottsdale does not have people in need, but there is a definite need for the working poor, seniors, and people who are just experiencing a rough patch. Seven of our top high school age Interactors, along with an exceptional group of advisors, will be leaving Phoenix June 29 on their way to Kenya, where they will be transforming lives through their gifts of crutches, wheelchairs and other mobility equipment that were collected by the Interact clubs of our district, and have already been shipped to that country. The group will be returning on July 16. The District Grant application for club projects in Rotary year 2018-19 must be submitted by June 30 on the project website: www.matchinggrants.org. Information about club qualification and the application process is found on the District 5495 website under Foundation tabs: Grant requirements, qualification and more/District grants. For further information, please contact Jim Bissonett, District Rotary Foundation Committee. I want to start by thanking the Satellite Club of Camelback Crossroads for inviting me to join them at their club visit last month. I had a great time seeing the interaction between such passionate leaders in our community. They were all involved in coordinating a service project, had prospective members visiting and recognized all the efforts of their chair as they planned the transition into the new Rotary year, quite hilariously I might add. What I knew as a Rotary club meeting looked more like friends around a table, having fun and catching up. Thank you for letting me be part of your night! In 2009, one Rotarian was overwhelmed when he read about the struggles homeless teens in the West Valley face each day just to stay in high school. The fact that these kids had nowhere to go and no safety net was unacceptable. 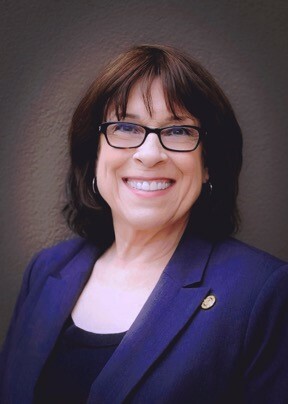 Working with his Rotary and local churches, they established Homeless Youth Connection (HYC) in 2010. In that first year, 47 students experiencing homelessness received support with basic needs from an agency who no longer viewed them as invisible. Since then, HYC has grown, and now provides services and programs designed to help homeless teens achieve a successful, self-sufficient future. HYC is very excited to report that we have surpassed our goal of serving 600 homeless youth this fiscal year. As of today, we have served 626 homeless youth, totaling more than 2,000 students since 2010. This is our final Vocational Shout Out for this Rotary year, so we wanted to share two items with all our Rotarian brothers and sisters. 75 individuals with the opportunity to receive a life changing vocational education using $161,793 in net funding! With your continued help and financial support, we can and will do more good in the world – right here in Arizona. 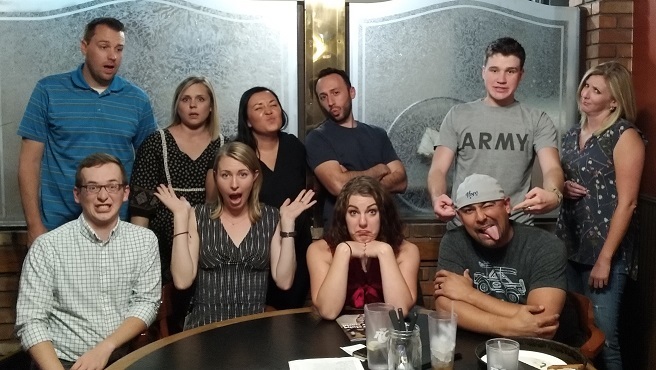 Our D5495 RLI program held a reception for its first 100 graduates on April 21 at the historic Aunt Chilada’s restaurant in Phoenix. Food and drink were accompanied by a salsa-making challenge that was enjoyed by all. Congratulations to all our RLI graduates! 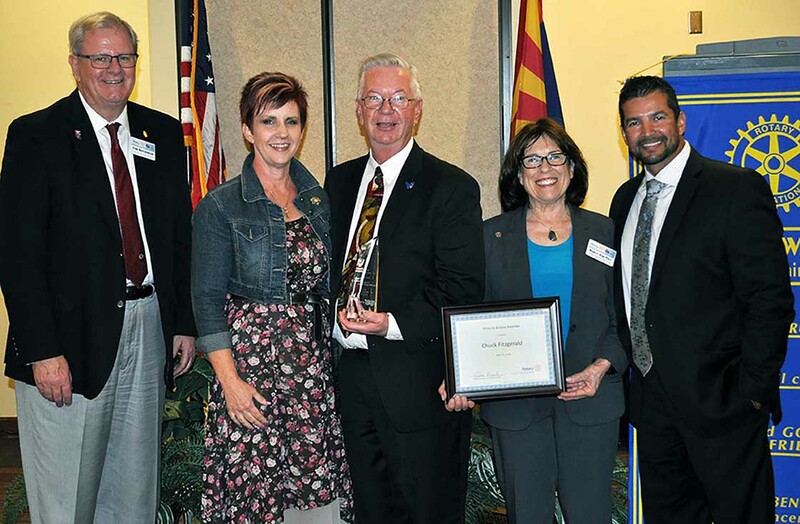 Recognized for his contributions to Rotary International, his commitment to maintaining high ethical standards and his passion for promoting peace, Peoria resident Chuck Fitzgerald has been named this year’s Ethics in Action Awardee presented by the Glendale West Rotary Club. 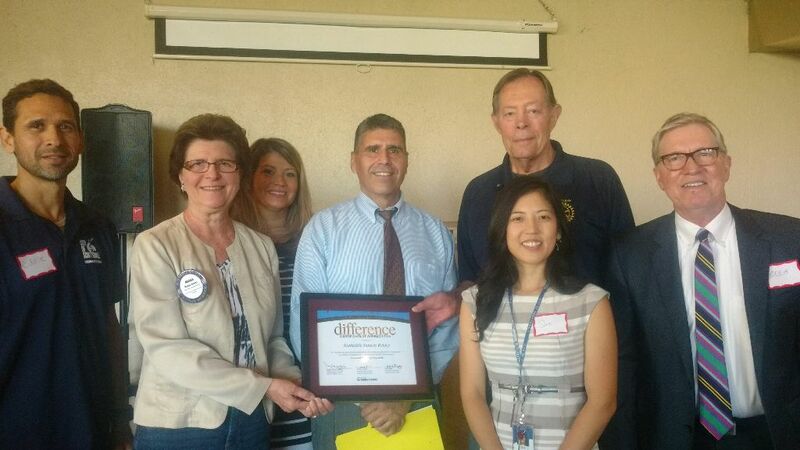 The announcement was made at the Glendale West Rotary Club’s annual Ethics in Action Award Program held April 26. Fitzgerald was chosen from a final list of nine nominees. 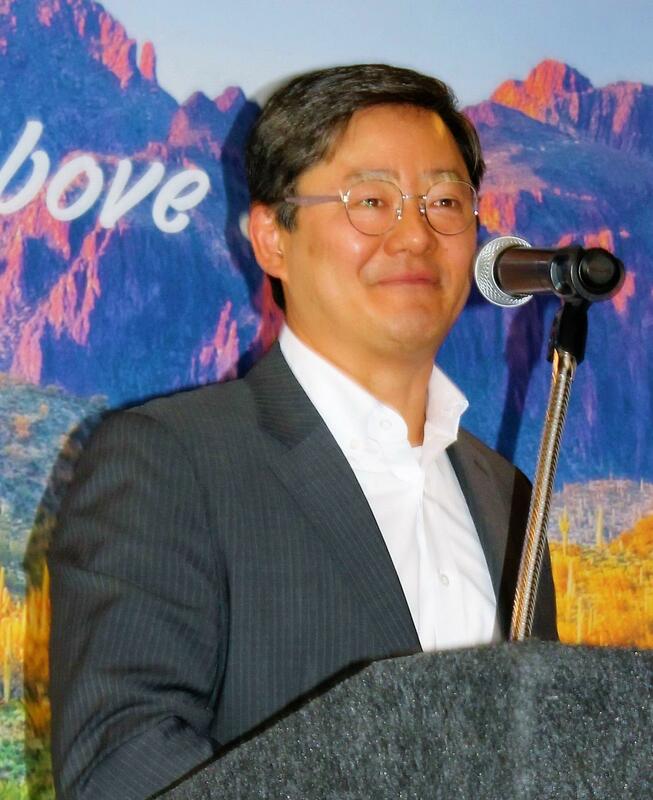 Rotary Club of Scottsdale members and guests welcomed Chris Yoo PhD, president and CEO of Scottsdale's Systems Imagination Inc. (SII), to the club's luncheon meeting at Scottsdale McCormick Ranch Golf Club's Pavilion. SII, founded by Dr. Yoo and Spyro Mousses PhD, is led by a multidisciplinary team of scientists and technologists with the mission of developing industrial solutions to massively accelerate the evolution of healthcare and life science knowledge. During his introduction, Rotarian Gay Baker stated that Dr. Yoo holds a bachelor’s from the University of Pennsylvania and a PhD from Yale University. Dr. Yoo is an experienced leader in understanding the latest biomedical and information-based technologies – both today's innovations and the future's potential – and in developing strategic ventures to prove the value of the molecular understanding of disease for better medical decisions. Ultimately, this will support better practice of medicine for the benefit of patients. Dr. Yoo worked for large technology companies, founded several startups, and published important research findings in respected scientific journals, all in the pursuit of the application of innovative solutions for the healthcare and life sciences Industry. 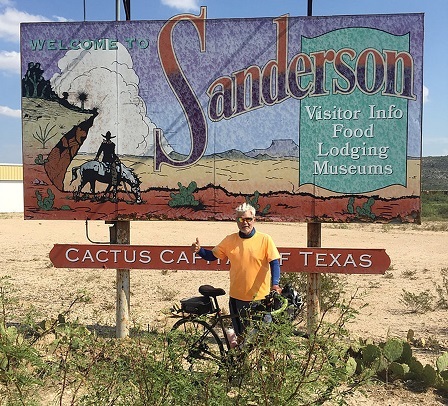 Four Peaks Rotary club member Buzz Ponce has made it half way across the USA on his charity bicycle ride in support of Warriors Heart, a treatment facility for veterans, active military and first responders who are dealing with PTSD and chemical dependencies. They say you can't "un-see" the horrors of war, or the traumatic incidents experienced by many of our first responders. Warriors Heart, in Bandera, Texas, is a top-rated PTSD and detox facility and Buzz is raising funds specifically for scholarships for veterans who can't afford to travel there and receive the treatment they need. Why Do I Have To Go To This Thing Called PETS? When you think about Rotary Exchange, you probably think of the youth exchange, high scholars who will study and live for a year in another country, and you have no idea of the possibility of spending 1 to 3 months in a country, being over 18 and less than 30 as a young professional. I was lucky enough to meet and have the opportunity to fulfill one of my biggest dreams. It all started with a neighbor, a Rotarian, talking to my mother about the possibility of my younger sister doing the youth exchange, and she is in Taiwan finishing her incredible year, right now. With that we hosted for the first time, my Polish sister Klaudia, and we started to participate and help in all Rotary activities, my mother started teaching Portuguese and now she is a Rotarian, and I'm here in Arizona. I can never thank Rotary enough for having this opportunity to come to Arizona and spend 2 months touring several cities and meeting incredible places and people. The Service Never Stops—Club and Corporate Partners in a Thriving Interact Program! What I like about Rotary is the service never stops. Every day somewhere around the globe you can be sure there are Rotarians out there doing good. It doesn’t matter if it is a new club or old club. The opportunities are endless. If you can’t think of one of your own, you can always help another club with theirs. The Pebble Creek Rotary club is one of the newest clubs in the district. They have partnered with the Interact District Council. 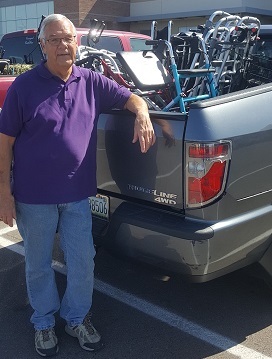 Members of Pebble Creek have used their connections with the Southwest Lending Closet to take the lending closets excess mobility devices. They bring them weekly to American Furniture Warehouse. They are our corporate partner. They store and help move our collections around the state. Please, if you are in the market for furniture check them out. The D5495 Foundation Committee has two major functions. First, we help clubs with TRF education and donations. Second, we help clubs access grant funds for local and international projects. We have accomplished quite a lot during the first year of the merger of D5510 and D5490. Clean those closets and donate to Peoria North’s Prom Closet project! 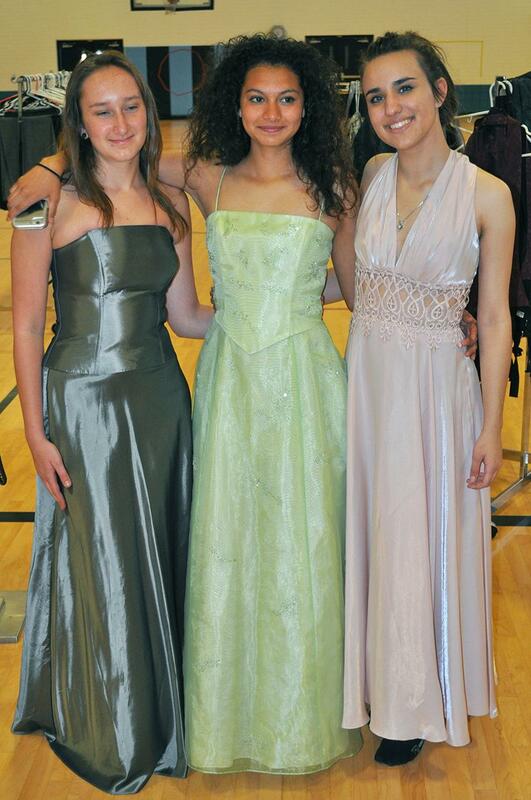 The Peoria North Rotary Club is asking Rotarians who attend the district conference June 1-2 in Litchfield Park to bring along a clothing donation for the club’s major service project: The Prom Closet. The club will have a table in the Hall of Friendship both days. Rotarians are invited to drop off clothing donations at the table.